Seahawk is but one of many nicknames for the awesome Osprey (Pandion haliaetus). This large, long-winged bird of prey cuts a striking figure, dark chocolate brown above and white below with a strong black line through its eye. This color scheme is obviously a bit more understated than the blue, teal, and chartreuse palette favored by the football Seahawks, but seems to work well for the raptor. 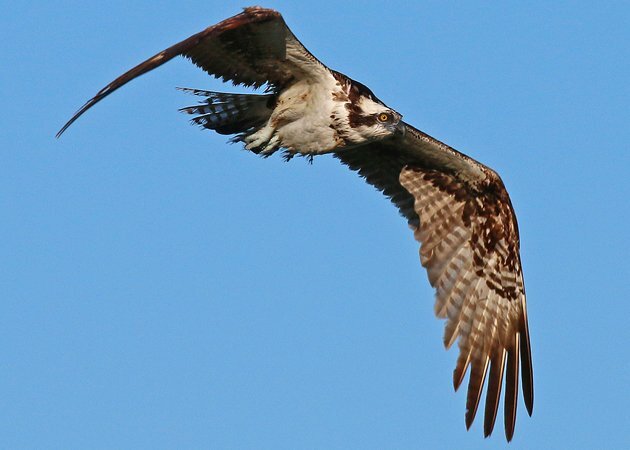 Most nature lovers enjoy the good fortune of spotting ospreys with ever-increasing frequency as they progress in understanding and awareness of the natural world. What makes such a common bird so special? Their size, sleekness, and sheer presence have a lot to do with it. But it is also human nature to fixate on those animals fixed firmly atop their respective food chains. Humans are fascinated with raptors like hawks, eagles, falcons, owls, and osprey because they are predators. On safari, you may be pleased to spot a zebra, but admit it…you’re there for the lions. The osprey is the most widespread raptor in the world. They can be found on every continent except Antarctica. 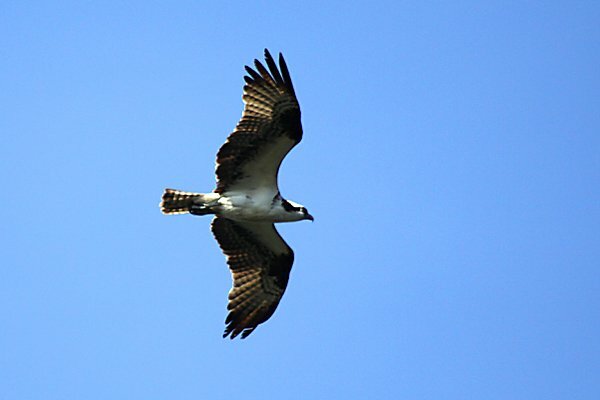 Like most raptors, osprey are migratory. They breed in temperate climates and winter in the tropics. 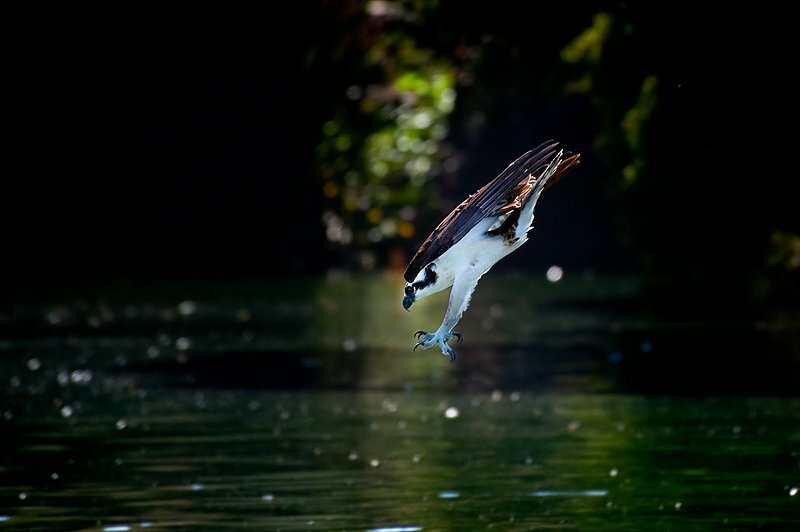 Osprey are particularly suited to catch fish, their primary food source. They possess a reversible fourth toe which allows them to grasp fish more securely by positioning two toes forward and two toes back. Also, the undersides of an osprey’s feet are covered in spiny spicules which prevent fish from wriggling free. They plunge feet first into the water to seize prey and may even submerge completely. A little known adaptation that facilitates these dives is the bird’s ability to close its nostrils. Osprey are only slightly smaller than eagles. The female osprey is larger than the male and may be distinguished by her brown spotted necklace. Osprey are one of the most difficult raptors to maintain in captivity. Although osprey were on the endangered species lists in most states since the 1970’s, they have successfully increased numbers due to conservation efforts since then. They are, for the most part, still considered threatened. Osprey are vulnerable to loss of habitat and organochloride pesticides like DDT. How are the Seahawks’ Odds This Year? 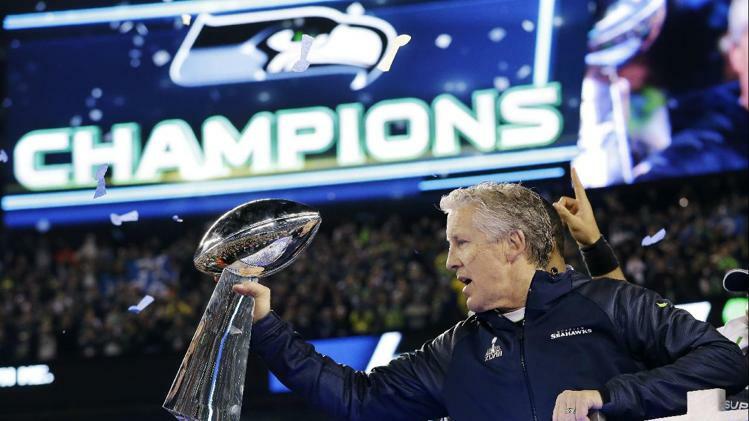 Even without checking their standings or depth chart, I can say with confidence that Seattle is not likely to win the Super Bowl. For that matter, neither are Philadelphia, Baltimore, Arizona, or Atlanta. In fact, in the first 47 Super Bowl match-ups from 1967 to 2013, only twice has a football team named for a bird emerged victorious in the championship game. The Baltimore Ravens crushed my beloved New York Giants in Super Bowl XXXV (2001) and also prevailed over the San Francisco 49ers in Super Bowl XLVII (2013) to become football’s finest feathered franchise. However… in Super Bowl XLVIII (2014), the Seattle Seahawks bucked this trend along with the Denver Broncos (see what I did there?) in a stunning rout that established, at least for that year, that defense wins championships. But the team’s resounding success in 2014 may be the only thing that can stop the Seahawks in 2015: Super Bowl champions very rarely repeat the next year. But i you’re looking to bet based on iconography, teams named for Homo sapiens just do better in this game. In an astonishing 33 of 48 contests, an organization named for a meat (not cheese) packer, chieftain, cowpoke, steel worker, indigenous American, gold miner, U.S. nationalist, servant of a deity, oversized individual, or some species of pirate has won it all. Is the bird that leads the Seahawks out of the tunnel on game day an Osprey? Actually not. Taima the Hawk, the only true avian attraction on Seahawk Sundays, is not an Osprey. Taima is an Augur Hawk or Augur Buzzard (Buteo augur), a species quite common in Africa but unknown in North America outside of football stadiums and raptor rehab centers. And in case you were wondering, Augur Buzzards aren’t sea hawks either: they prefer mountains, savannahs, and grasslands. I really enjoyed your osprey photos. I have been watching ospreys out in Greenport, Long Island NY and was lucky enough to be able to shoot photos from right under the nest platform. I have a slew of photos and wonder if you would like to see them? Hello, Today 12-7-08 while driving in Brookfield Massachusetts we saw a large bird on the bank of a pond. It then flew to the edge of the ice. We turned the truck around and went back to get photos. I got 5 or 6 good shots. We thought it was just a really big hawk. Tonight while watching the football game with the Patriots ( we won!) and the Seahawks they showed a picture of one. Answer to our question of this morning. Funny how that happens. The first two shots I took, the bird is looking right at me! Then I got some in flight. Very informative story about the Osprey, one of my favourites here in Africa as well – and must confess I’ve never come across somebody who has said ‘no’ to seeing an Osprey. Interesting little fact about the nostrils – something I didn’t know. The Seahawk is also the mascot of the University of North Carolina at Wilmington. Their logo is clearly based on the Osprey. Recently a 20 foot copper statue of an Osprey (Seahawk) was dedicated on the campus. Ironically, despite having over 11,000 students they have no football team. Real Ospreys are sometimes see around Wilmington. Like the info and the pictures given re: Seahawk bird. Is there any green on the bird? Wondering how the Seahawks football team came up with their new color scheme which includes that lime green color. My husband thinks there is green on the bird? @Donna Alexander: Actual Osprey have no green in their plumage. Could someone please explain to me why you love bird’s so much? Very interesting and beautiful website. I love all of the birds. They are the decorate of God. And give a happiness to all of the human. Seattle was not the first pro team to take the name Seahawks. The old Miami franchise in the All American Football Conference was named the Seahawks. It last one season, 1947. The next year, the league replaced the franchise with the Baltimore Colts. I saw for the first time two Sea Hawks fly on to a palm tree in Mission Bay Park, San Diego, CA. Wow, what beautiful birds. We have many red tail hawks here, but I’ve not seen Ospreys here, bad non-sightings perhaps. Their marking and black hooked beaks are very cool. Up until this December in Houston Tx, I had never seen an Osprey, but while walking the dog one cold morning, there it was circling a pond at the park. I new that the military has a plane by the same name but until this beautiful bird hovered over the water before diving for a fish, it never occured to me the reason for naming the plane. I was blown away to see a bird that size stationary in mid air, eyeing prey! thanks for the logo of seahawks, explained ! The Osprey is my most favorite bird. We live on the Connecticut River and I see them in the summer and fall. My husband just asked me, “what kind of bird is a Seahawk?” I answered, “the Osprey” and he said it didn’t look like one. I realized the Osprey is also called the Fish Hawk, that’s why I checked for sure, here. Glad I was right the first time. Papacious, if you’re asking which raptor can hover, you’ll need to provide more info. A number of birds of prey can hover for a small length of time, but kestrels are most renowned for their ability in that regard. A ” Seahawk ” may be an Osprey, but the Osprey is NOT the mascot of the Seattle Seahawks. Their mascot is an Augur Hawk ( Buteo Augur ) named Taima who leads the team flying out onto the field before games. When I saw the bird on TV tonight I didn’t recognize it and I had to research it – found your site, but I knew the bird was not an Osprey. Go to http://www.seahwks.com/gameday/taima-the-hawk.html to check it out. 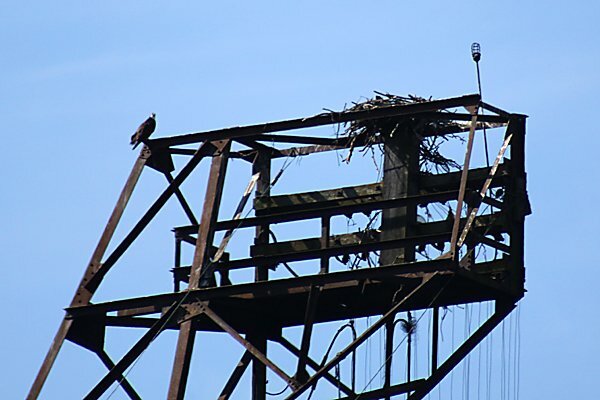 Fort Washington, Pa. – seen a LOT of Ospreys ! 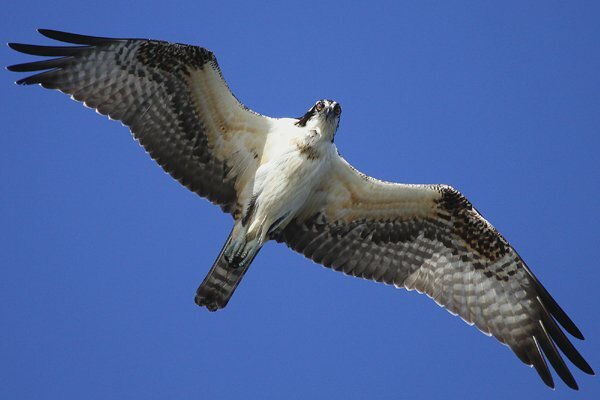 The bird that flies out of the tunnel before every seahawks game is not an osprey. Check out the seahawks web site for the official answer. This doesn’t mean you are wrong. An Osprey is obviously a Seahawk, it’s just that the seahawks football team didn’t use a real seahawk. The Seattle Seahawks are going to the Super Bowl this year!!!!!! !